It is a little known fact that the name Prius comes from a Latin term meaning “to go before.” In 1997, when the world’s first mass-produced hybrid passenger car went to market, a quiet revolution had just begun. Today there are over 50 different hybrid models from the various automakers of the world, while the Prius line itself now comprises several trim levels of four different models including the Prius Plug-in, Prius V and Prius C.
The US launch came in 2000 followed by the second generation in 2003 and the third generation in 2009. Over this period, Toyota managed to greatly reduce the cost of the hybrid system by two-thirds while significantly increasing fuel efficiency. 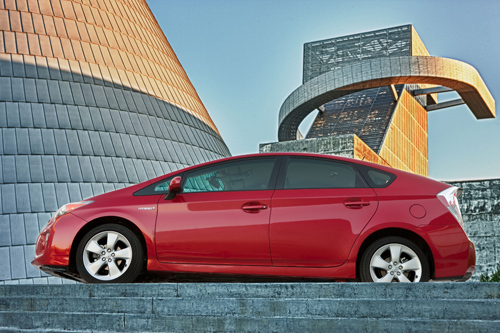 The continued innovation within the third generation Prius merited application for 1,261 patents, revealing that the Prius revolution is a continuing process. Research and development of hybrid and other technologies continue in Japan as Toyota seems poised to make To Go Before a company wide mantra. In 2014, the firm has allocated $8.84 million for the development of new environmental technology, vehicle platforms and components. At the same time, Toyota is planning over $9 million in capital investments next year, with slightly under half in Japan and the rest at facilities around the globe. Among the facilities to emerge from this outlay are a new Research and Development facility plus a new Powertrain Development and Production Engineering Building, a 12-story structure with over a million square feet of floor space in Toyota City, and an Aerodynamics Laboratory able to produce winds of 155 mph, in the Honsha Technical Center. Some of the automaker's suppliers are implementing capital expenditures as well, particularly Primearth EV Energy Co., Ltd., producers of the batteries used in Toyota’s hybrid vehicles. Only rarely do 16-year-olds accomplish so much – one can only wonder what the iconic little car will have accomplished by the time it reaches majority in 2018.